Compressor clutches & coils are often damaged during vehicle collisions. 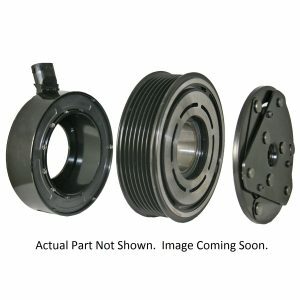 The purpose of the a clutch assembly is to turn the shaft inside the compressor. So, if you have a bent clutch and a undamaged compressor body, you can save some money by replacing the bent parts. Also, buy a quality clutch assembly if you want your compressor to last. We have clutch assemblies available for all types of compressors. This includes compressors that fit passenger, heavy duty, agricultural & fleet vehicles. You can purchase premium clutches & coils here for less! We stock new clutches and & coils that fit 1,000s of compressors. Our new aftermarket clutches & coils perform just like the original. Each is designed to fit the original compressor on your vehicle. In addition, our stores and warehouses stock remanufactured in USA clutches & coils. These perform exactly like the new in every way. So, feel free to save some money and purchase a rebuilt clutch or coil. You will not regret it. Also, if you are located near one of our locations and you have your compressor off of the vehicle, we can help you install the clutch and/or coil for a small fee. Or, we can refer you to a quality mechanic in your area.